Produced by 3 Quacks in association with Sydney Independent Theatre Company, TIDY TOWN OF THE YEAR, by Andy Leonard, Sarah Hodgetts and Victoria Greiner at the Old Fitzroy Theatre, Woolloomooloo. 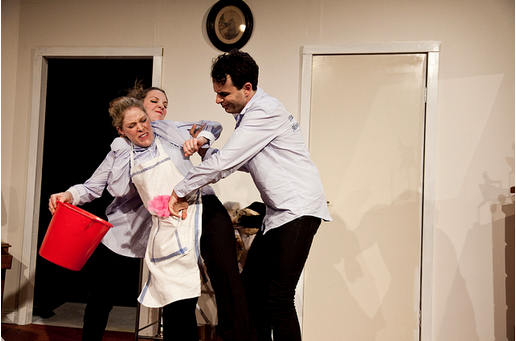 Three 'kids' (forgive me, if inappropriate) in the 'kitchen' of playmaking, at the Old Fitzroy Theatre: Andy Leonard, Sarah Hodgetts and Victoria Greiner, have produced, written, and are performing, in TIDY TOWN OF THE YEAR. They have taken on the fearsome genre of "black comedy", even more daringly, "black farce." Town rivalry, petty jealousies, cruel behaviour, mistaken identities, revenge tactics, murder, blood, a bulky body bag, packeted body parts, plus a revealed, latterly in the action, new identity, and you have some of the recipe being 'cooked up". Add some pop-culture references that could bring a smile of recognition to your face, a pile of familiar and some lame jokes, which may not. These 'chefs' have the form of the genre pretty well down but need now a sharper 'pencil' to build a firmer and funnier play. This farce has only two doorways, and only one with a door, and that, really, is not enough for comic farce - ever. It is encouraging to see such faith and hope going on with this young company who have put their money and time where their dreams and aspirations have led them.- the stage at the Old Fitz. They have taken the plunge into the kinetic world of the theatre and, hopefully, are learning a lot about the tasks they are attempting. Assisting them is co-director, Deborah Jones, and the virtually under-known, and under-estimated directorial talent and writer, Sean O'Riordan. My best advice is listen closely to your audience and take notes every night and discuss volubly, afterwards. Check out, the STC production of NOISES OFF (count the number of doors!) read, and go see Bruce Norris' CLYBOURNE PARK, coming up at the Ensemble Theatre in a few weeks. Have some readings around the lounge room or dining room table with your mates, of some of the works of Georges Feydeau, Ben Travers, Avery Hopwood (a special favourite of mine), Kaufman and Hart, Ben Hecht, Joe Orton, Ray Cooney and the famous White Hall farce teams, Neil Simon and anything by Alan Ayckbourn, discuss, take notes and try again. Rowan Atkinson's Black Adder series is a great inspiration for this kind of work, and you can not only read, but watch that - a great way to spend the coming Autumnal nights into winter. Oh, and Joanna Murray-Smith's THE FEMALE OF THE SPECIES, is worth a gander as well. This show is for family and encouraging friends of the company. However, if you admire the brave spirits of the young and have the time, join the family and encouragers. Go. The 3 Quacks company have delved into a genre where angels usually fear to tread. Thanks for this go. Look forward to the next 'dish'. We need the serious risk takers with Australian writing, who are 'crazed' enough to put up their own money and time for their preferred art form - it's an incurable illness, tell your families and friends.